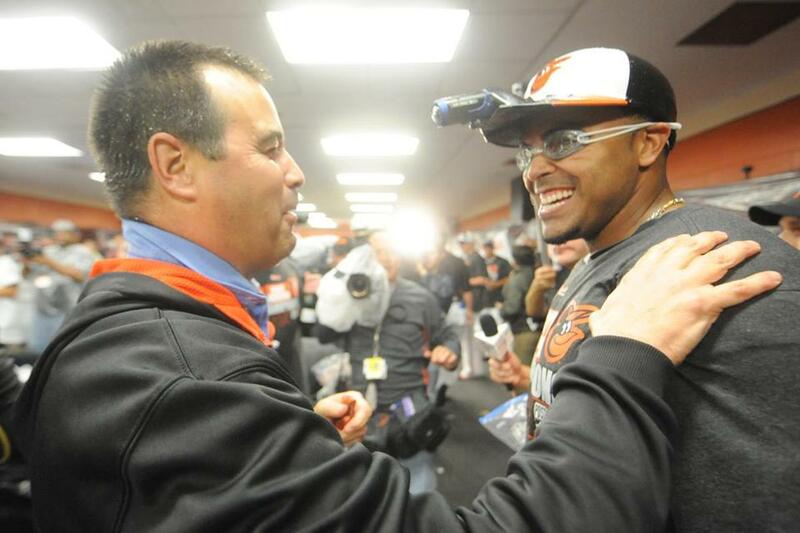 Dan Duquette and Nelson Cruz celebrate the AL East title. KANSAS CITY, Mo. — Dan Duquette will leave it to others to come up with the right words to motivate the Baltimore Orioles before Game 3 of the American League Championship Series on Monday night. He will stand quietly off to the side and observe because he has always been good at that. But what a story Duquette could tell the Orioles, who dropped the first two games of the series against the Kansas City Royals at home. Think losing two close games is tough? Consider growing up in Massachusetts loving baseball and getting the opportunity to become general manager of the Red Sox at age 36, then losing the job eight years later when new owners took over. Many in the fan base and media celebrated like it was a holiday; that’s how bitter everything and everybody had become. That Duquette modernized a stodgy organization and rebuilt its fallow minor league system was forgotten. A few years later, a roster loaded with players Duquette drafted or acquired finally won the World Series. He was just a footnote. Duquette spent 10 long years away from baseball, turning down lesser jobs in the mistaken belief another team would want him as their GM or president. He built a sports camp for kids, then founded a league in Israel that folded after a year. He ran a college summer league team that, as a GM, he probably wouldn’t have bothered sending scouts to see. There was a divorce and self-reflection that lasted years. Even the people who wanted to help started to wonder where his path was leading. John Schuerholz offered a position with the Atlanta Braves that Duquette respectfully turned down. The Red Sox, Duquette revealed, asked him back as an adviser a few months after he was fired as GM. Team president Larry Lucchino made the offer, impressed by the foundation Duquette had built. “I have long thought Dan deserved more recognition for his role in our early success in Boston,” he said. “It was time for a change,” he said. “It was a grind, especially in that media market. I needed time. I got an opportunity to coach my sons in Pop Warner football and Babe Ruth baseball and in basketball. My daughter went to school in New England. I spent time with my family and I needed to do that. In all the wrong ways, it was somehow a perfect match. Duquette needed rescue from exile and the Orioles were desperate for a GM with credibility. One candidate declined an interview after discovering how onerous working for owner Peter Angelos would be. Another was offered the job and turned it down. When Duquette was named, it caught the industry by surprise. The Orioles fit. Duquette relished the challenge of competing against the Red Sox and Yankees in the American League and had just enough financial clout to build competitive rosters. Baltimore has averaged 91.3 victories in his tenure, and this season ran away with the division. Showalter, though shrewd, was often inflexible in previous stops and came to Baltimore having lost three jobs. Like Duquette, he’s more measured now and the two have meshed well, manipulating the roster constantly in search of even minute advantages. “It’s a very deep team,” Cherington said. “There may not be elite performance from any one particular player, but there aren’t any negatives. Duquette has worked on building relationships with Showalter, others on the staff, and even the players. Jim Duquette, Duquette’s cousin and a former Orioles executive, is around the team often as an analyst for MLB Radio. This version of Duquette, he said, is not the same one the Red Sox had. “I’ve noticed distinct changes,” Jim Duquette said. “Little things don’t bug him like maybe they used to. There’s just more appreciation of being around the game, a kind of looser feeling. It’s been beneficial, the time off. That more relaxed attitude is particularly evident when Duquette is around the players. He even has a nickname in the clubhouse. “Thunder Dan, he’s kept us competitive,” center fielder Adam Jones said. “He’s getting players over here that other places didn’t necessarily want or fell out of grace. He gets people who come over here and have a hunger to succeed. Other players feel the same way. They respect Duquette’s acumen, if not his crew-cut-and-rumpled-suit sense of style. Duquette might think Louis Vuitton is a prospect from France. “You see Dan and . . . Dan’s awkward,” Jones said. “We all know Dan’s the most awkward GM in baseball. He looks like a custodian worker when he walks around here sometimes. But that’s Dan, that’s who he is, and that’s why we joke with him and get on him and have fun with him. Duquette, 56, has remarried. His wife, Amy, had a baby boy in May. Between them, the couple has seven children. He made time to build a life, not just a team. Then he paused, uncomfortable talking so much about himself.